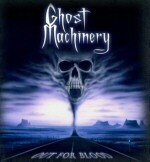 RockUnitedReviews: GHOST MACHINERY: "Out For Blood"
Ghost Machinery is a band formed by Pete Ahonen, also known as the guitarist/vocalist of Burning Point and the guitarist of Stargazery. This is their second album, and the first to feature the vocals of Taage Laiho. Taage's one of the Finland's premier metal vocalists, best known as the singer of Kilpi and for his stint in Altaria. I guess it's not surprising that Ghost Machinery is a band that plays rather traditional melodic metal, with traces of Malmsteen, Dio, Iron Maiden... and Bon Jovi?! Yep, the band has definite melodic sensibilities, so fans of harder-edged AOR could pay attention too. The album gets a hard-hitting start with two metallic, uptempo tracks with good hooks, namely "Face Of Evil" and "Out For Blood". The heavier "Guilty" has some cool fanfare-like guitar/keyboard interplay, but I'm not so sure about the chorus. The chorus of "Blood From Stone" I am definitely sure about, it's damn fantastic, as is the keyboard-intro and the whole song really. Imagine Yngwie Malmsteen covering Bon Jovi and you're pretty close to the truth. The sheer brilliance of "Blood From Stone" has admittedly overshadowed the other tracks for me, but now that I've had a closer look at each one of them, I gotta say that there really isn't a bad song to be found. The band's Blackfoot cover "Send Me An Angel" is very good, and the hooks of "Sentenced To Life (In Paradise)" and "Mask Of Madness" are hard to resist. The "obligatory" ballad "Lost In Time" is a quality track too, and Helloween fans will get a kick out of "Eternal Damnation". So... highly recommended for those of you into traditional melodic metal.